While this year is much better than last year, it’s still HOT. We were at 108 F with humidity of 30%. This is just downright miserable temperature and our electric bill is out of sight. The garden is on perpetual life support right now so harvesting fresh greens is out of the question. So what to do for dinner? Baby Lady and I love tuna. We also love tomatoes. 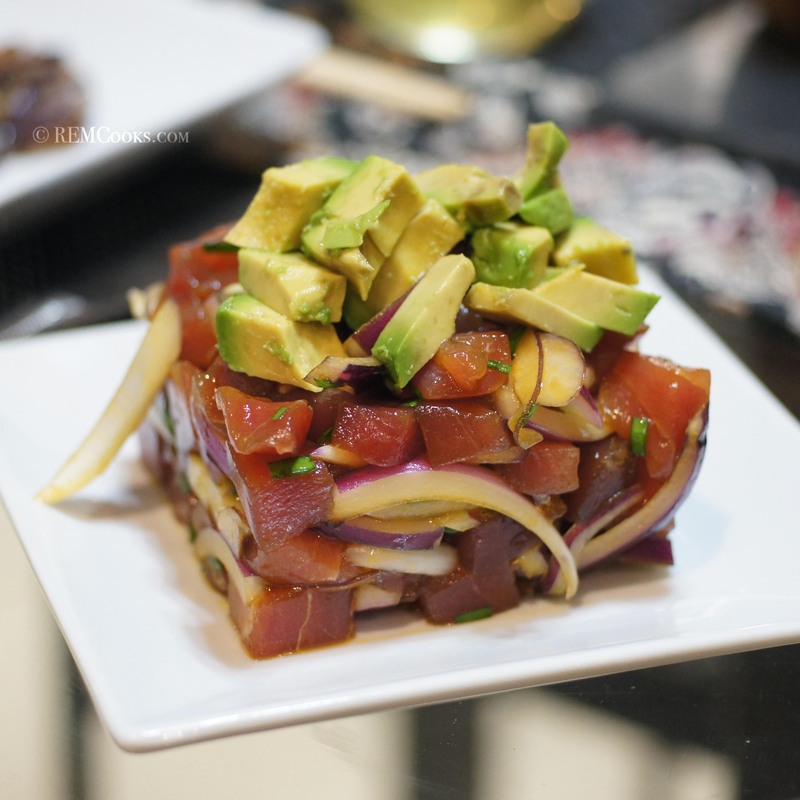 Our local market always carries fresh bluefin tuna flown in fresh from Hawaii daily. It’s always wonderful and it was on sale so we bought some. While we were there we noticed they had beautiful fresh East Texas tomatoes so we bought them, too. Now that we had them, what to do? Well, tonight was a no heat up the house night. No oven, no stove. Just simple, light, delicious fare. Hawaiian style ahi poke with a caprese salad. You cannot go wrong with this meal when it’s hotter than Hades outside. Baby Lady took care of the caprese while I took care of the poke. While it may seem odd, this was a remarkably successful paring. The bright acidity of the caprese salad went well with the salty fattiness of the poke. Delicious and cool! Caprese salads are truly simple to do. Baby Lady makes a variation on a traditional caprese by adding caramelized onions. 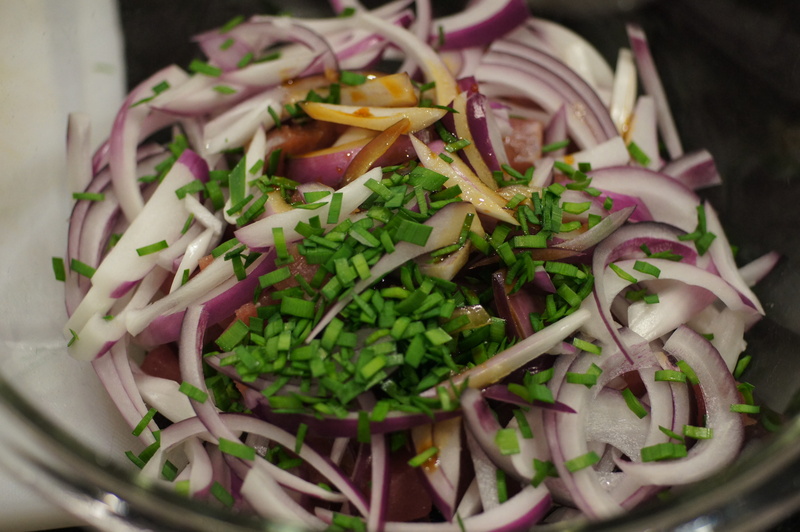 Caramelize the onions over medium heat. Slice the tomatoes and mozzarella cheese and chiffonade the basil. Drizzle the balsamic vinegar reduction on the plate. 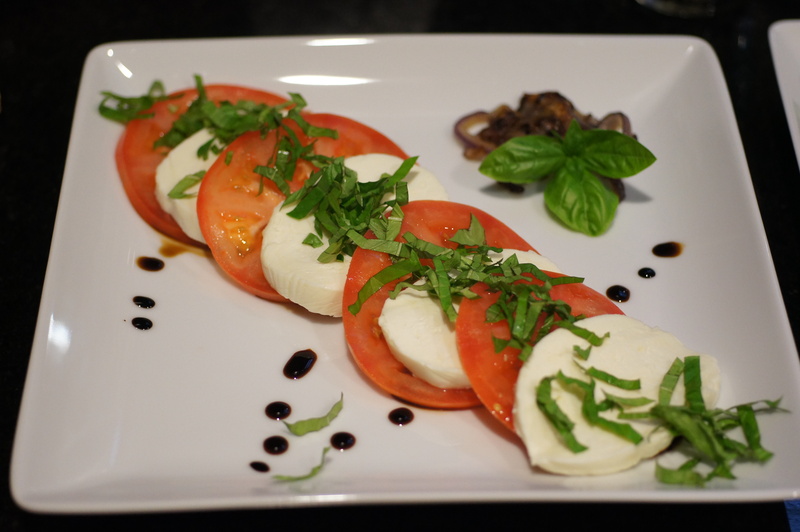 Place the tomato and mozzarella slices on the plate alternating between the tomato and mozzarella. 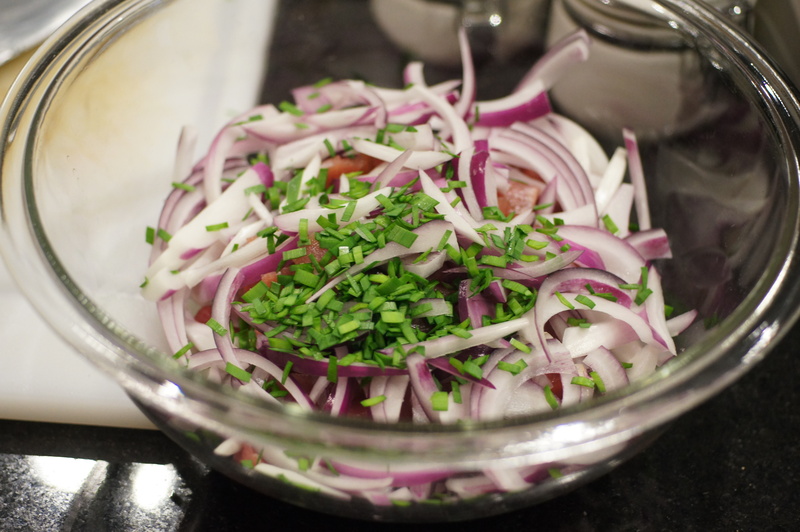 Sprinkle the basil over the top along with some pink finishing salt and serve the caramelized onion on the side. Aint this a beautiful dish? Add the soy sauce, the sesame seed oil, and Pele’s Fire Macadamia Nut Chili oil. sprinkle with Chardonnay salt. Serve & enjoy! I just had an insalata caprese for lunch today with bufala mozzarella and cherry tomatoes from the garden. This is why I grow tomatoes! Living here in Chicago, i wouldn’t know where to find freshly caught blue tuna. It’s a safe bet that any tuna I do find, will have been frozen before it got here. If I ever do find some, though, I’ll be sure to come back here. This sounds fantastic, Richard, and looks incredible! Thanks, John. I’m glad you liked it. I wish our garden would grow tomatoes. We just have very little success with them. It gets too hot too early so the fruit won’t set and we get blossom drop. I get lots of beautiful green tomatoes in the fall when temperatures are cooler but they never ripen before the first freeze. 😦 As for fresh bluefin in Chitown, I’m certain there is a fishmonger that has it flown in fresh. You need to call one of the finer sushi bars and inquire where they get the ahi for their sushi. It is very hard to find sushi grade tuna here. Your meal looks terrific. Thanks for your nice comment, Karen. 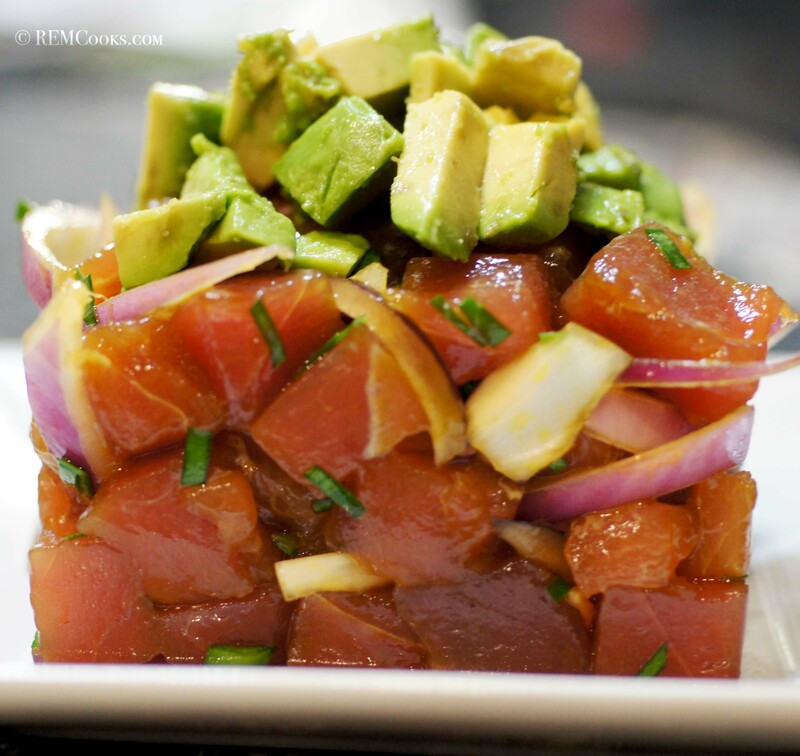 We love Ahi Poke. The wonder of air cargo has changed the world of food; otherwise, we wouldn’t get sushi grade tuna in Dallas. Of course, the best tuna I have ever had is still hawaii but I haven’t been to Tokyo, yet. Thanks for dropping by and your nice comment. We love meals like this on hot evenings and lately we have had quite a few. Kajiki (blue marlin) makes a great fish for poke, too. If you make one, post it so I can see your approach to poke. It’s always fun to see the different things people do. I can’t believe you found ahi at the farmer’s market in Texas!! Your photos makes me happy and sad at the same time, man I miss eating fresh poke!!! Even your salt looks gorgeous. 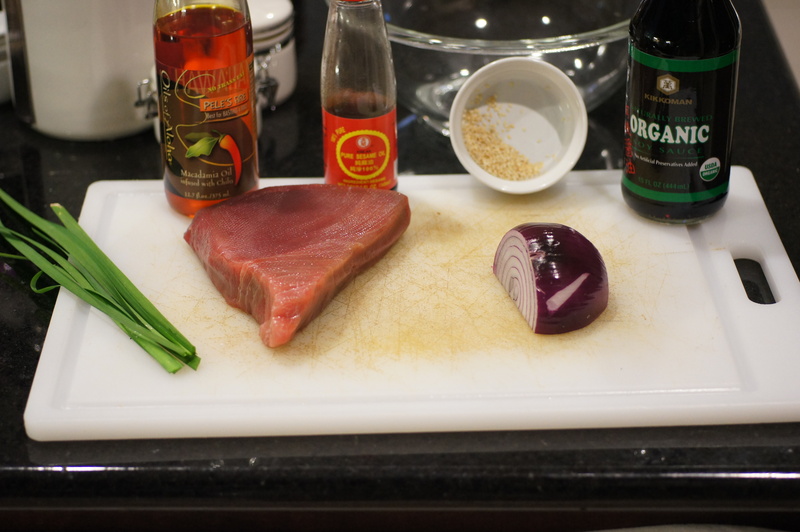 sigh…..
Oops, we found the ahi at our local market, not a farmer’s market. I guess I wasn’t very clear. Our local market is a large gourmet super market that has lots of local foods, a huge fish market, meats, etc. We will be glad to but we ate all if it so I will have to make some more. 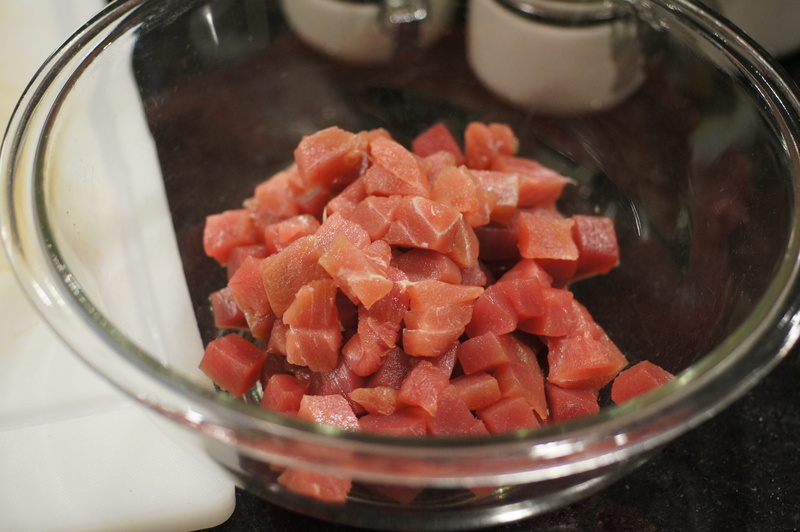 I would love to find some fresh blue marlin so I can make a kajiki poke. I like that as much as the ahi poke. Sashimi-wise I don’t care for au, but as poke it’s not too bad with all the seasonings. Then again, it could be that I only had junk pieces for sashimi, so I can’t be too critical! Hi Stefan. Thanks for the compliment. 🙂 We use the Pele’s Fire because we had it on hand and I wanted a little kick to the poke. You can use any chili oil. We just like the sweetness of the macadamia nut oil. You can find it online at Amazon for US$ 6.75 but I have no idea the shipping cost or if you can even import it into NL. As for the garlic chives, I grow them and like to use them whenever I can. 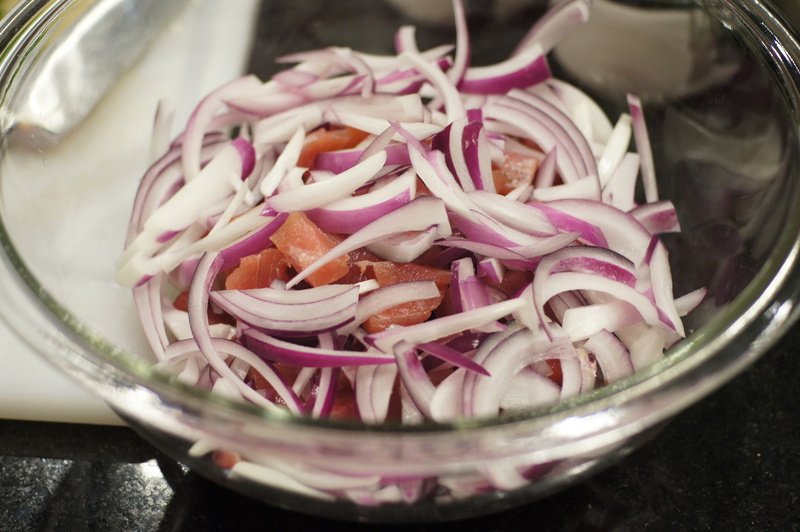 You don’t need them but they add a slight garlic flavor and some color to the dish. Most Hawaiian poke has seaweed but I can’t get that fresh in Texas. For a little texture, you can add flying fish roe if you can find it. It’s typically sold in frozen blocks and isn’t too expensive. I’ve done some googling and noticed there are many variations. So I’ll try to make it with what’s available here. Thanks for the idea! P.S. 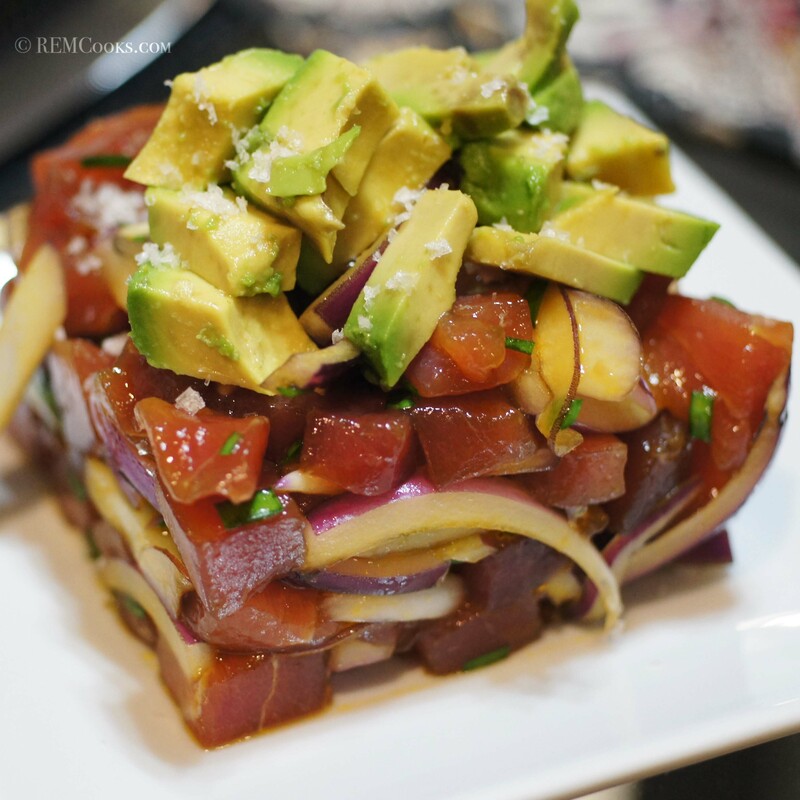 Ahi is a local Hawaiian type of tuna closer to yellowfin than to bluefin, right? Ahi actually refers to both yellowfin and bigeye tuna. I used bluefin because it is what was available at the market. Bigeye must be the local one. Bluefin is very hard to get (and expensive) here, but sushi-grade yellowfin is flown in. Love the presentation! Restaurant quality! Thanks so much for your very nice compliment. You’re so sweet. Thanks for dropping by, trying the recipe and taking the time to post your very nice comment. 🙂 We love to hear from people who try the food. I’m sure the addition of the radish sprouts and masago made this incredibly delicious. Thanks again.